The prescribing cascade is an essential part of equine practice in the UK. It applies some basic principles that allow veterinary surgeons to treat animals using drugs not licenced for that condition in that species. The cascade is complicated by the classification of horses as food producing animals and further information on food producing animals can be found here. The documents provided below are designed to facilitate compliance with these requirements and have been proven to be helpful when considering the Practice Standard Scheme. They can be dowloaded and provided to clients when such medicines are used. If there is no label for a medicine you are using feel free to contact the BEVA office and it will be added to future documentation. Generic information leaflets are available at the end where no specific example is included. Informed consent is a professional obligation when using medicines under the prescribing cascade. Although consent can be given verbally, the RCVS expect that consent will be given in writing. When the client is not available to give written consent, contemporaneous records of verbal consent should be recorded. The form contains dynamic content - it will not function in mobile web-browsers. On mobile devices you need to open this page in the relevant PDF software. It is recommended that you save the document to your device and add your practice details. Practice details will be maintained each time you press RESET. In addition to each unlicensed antimicrobial we have provided a generic description that applies to all prescribed antibiotics. It is not an obligation, but providing labels onto dispensing bags will promote the importance of antibiotic resistance. Copyright and reuse: All documents are provided under the creative commons non-commercial share alike licence, meaning that you can amend them, for example applying your own branding, but that attribution to BEVA must be retained. 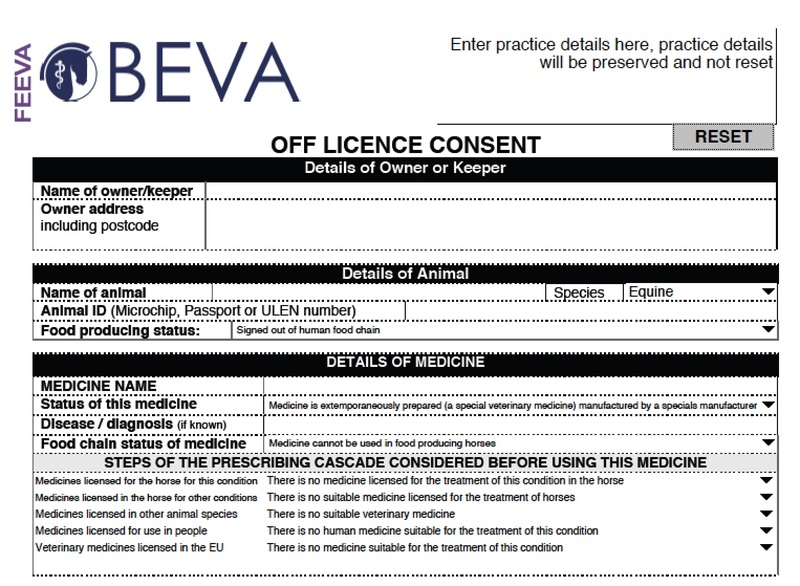 Disclaimer: Presence of a client information leaflet does not mean that BEVA endorse or recommend the use of a particular medicine and veterinary surgeons should ensure that they understand how the cascade applies to the horse and should ensure that use and dosing are appropriate to each clinical scenario. Detection times: Please note that detection times for commonly used equine medicines can be found on the Sports Horse Committee pages. However, formulation of medicines not licenced for use in horses may differ.